Badenscallie is just east of Achiltibuie in Coigach. 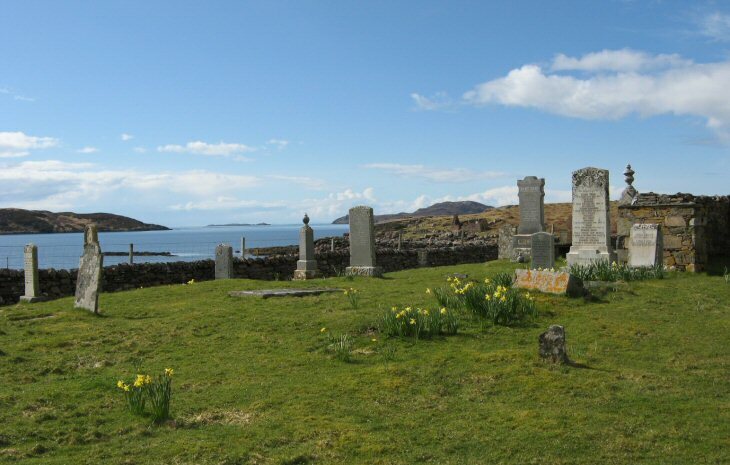 The burial ground is at the back of the beach with views direct to the Summer Isles. This is a long-established burial site, but many stones must be lying below the sandy turf. Stones nos. 1516-1544 are within the extension area. My grandparents John and Mary MacLeod are buried here alongside many more MacLeod ancestors. My family and I visited in Summer 2014. It is a most beautiful spot. Added by Sheila Davis on 27 March 2015. My gtgtgrandfather, John MacLeod, cathecist & teacher (wife Annabella), was buried here in mid-19thC, but no stone found. Their daughter Alexina married my gtgrandfather Duncan McPherson in 1855. Added by Roddie Macpherson on 08 May 2017.